Prof. Che Xiangqian was the first president of Taigu Che Yizhai Xingyiquan Society (currently acts as its honorary president) and for many years acted as president of Shanxi Province Taigu County Martial Arts Association. Che started his Xingyiquan studies under Che Caizao (Bu Xuekuan's disciple) in 1950. 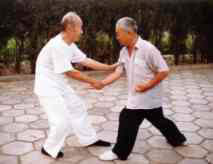 In his articles Prof.Che actively promotes development of traditional art of Xingyiquan. 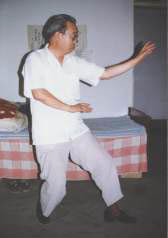 He has greatly contributed to demystifying of Xingyiquan, explaining the principles, practice and applications of the art in simple and easy to understand manner. Che Style Xingyiquan with Che Yonghong as its main representative, is a crystallization of collective wisdom and experience of Che Yonghong and vast numbers of his disciples with Li Fuzhen and Bu Xuekuan as key figures; it is a branch of Xingyiquan that was formed through practice as a summary of rich and varied experience of its practitioners, with Li Luonengs Xingyiquan as the base and by assimilating strong points of other styles; this combination of health preserving exercise and fighting art created by master Che, master Li and master Bu can be used as a criterion for judging real value of any martial art. I have studied and practiced Che Style Xingyiquan for 49 years, and am very fortunate to express its unique style in a poetic form of this ode! Che Yonghong (1833-1914), also called Che Yizhai or Second Master Che (Che Er Shifu) was born in Taigu in Shanxi Province. Coming from a poor family he first worked as a carter. In 1848 started his martial arts studies of Shaolin boxing under Wu Hongpu and Wang Changdong. In 1856 Che was accepted by Li Laoneng as a student and learnt Xingyiquan. Che was a very good fighter, especially skilfull at hitting with fourteen parts of body (Shi'er Chu Dafa). He changed and reformed Xingyiquan to form his own branch, famous for narrow stances and refined power - Che style Xingyi. After becoming a proficient master, Che worked as a guard of rich mansions in Taigu for over thirty years, everyday practicing free fighting with his disciple, Li Fuzhen. Most of those, who went to challenge Che, were defeated by Li Fuzhen. In 1988 Che went to Tianjin where he crossed swords with a japanese master and defeated him. His most famous disciples were Li Fuzhen, Bu Xuekuan, Lü Xuelong, Fan Yongqing, etc. Li Fuzhen ( 1855-1930), also called Changyou Master (Changyou Shifu), started to study Xingyiquan under Che Yonghong at the age of thirteen. Later Li Fuzhen worked for many local banks as a guard. Li was very famous for his fighting skills, always defeating challengers. However once he was kicked by a martial artist, Wei Changyi (Chuojiao Fanzi Quan expert from Hebei province), and, surprised by Wei's skill, asked him for teaching. Later Li changed what he learnt from Wei into Xingyi's Eighteen Kicks (Shi'ba Tui), also called Mandarin Duck Kicks (Yuanyangjiao). Bu Xuekuan (1876-1971) started Xingyiquan study at the age of sixteen under Che Yonghong. 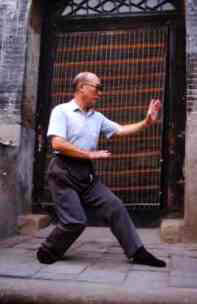 He also learnt Yuanyang Jiao (Mandarin Duck Kicks) together with Li Fuzhen and Taijiquan and Baguazhang from Sun Lutang. Bu compiled set of health preserving exercises "Marrow Washing Classic" (Xisuijing), Xingyi practice with partner (Xingyi Duilian), Linked Hands (Lianhuanshou) and famous technique he became famous for, "Lion Swallows Hand" (Shizi Tun Shou). In 1913 Bu started to accept students, of whom the most famous were Sun Deyi, Zhang Yongyi, Yan Yuewu, Wu Chaoxiang (who took Xingyi to Brasil) and Li Ying'ang (who taught in Guatemala). Bu Xuekuan became president of Taigu Sports Association in 1918 and martial arts coach at Taigu Mingxian School (the school was established in Taigu by Americans) in 1932. Later Bu was also director of Taigu County Guoshuguan (Martial Arts Academy). After liberation (1949) Bu Xuekuan was actively promoting Xingyiquan in Shanxi Province as well as taking part in political life. Bu died at the age of 96. His youngest son, Bingquan, was born when Bu was 70. Che Yonghong's inheritors practice Xingyiquan not for fame or personal benefit, but for good health, fighting skills and out of interest. One learns the rules of the school before learning martial art, and the core rules are "good health, self-defense, loyalty (to friends, gongfu brothers, etc)". However, the main goal one should pursue is fighting skill, which in Taigu dialect is called "Si Pa". One can only practice martial art well if the principles are clear; knowing movements, routines, applications is not enough. Since martial art is a practical science, it has many examples showing its methods and principles. The requirements in Che style regarding movements, postures, coordination, rhythm, breathing, use of Intention (Yi) have specific expressions in Che style routines. The harmony between Form (Xing) and Intention (Yi) means relation between external movements and internal intention, e.g. the idea kept in mind while performing the movements. These two should be united. Old saying says"Once he stretches his arm, it is clear if he has it or not", which means once a martial arts practitioner makes a move, it can be seen whether his Form and Intention are united or not. Hardening exercises are forbidden, do not practice too much of still methods, Qi and Strength should combine so that Internal and External are connected; Do not practice until exhaustion but be persistent with it; the skill should grow but good health be preserved, so balance your practice with Tuna (breathing) exercises. Hardening exercises like hitting sand bags (Da Shadai), lifting weights (Ju Shisuo), hitting wooden targets (Zhuang Mutou), Iron Sand Hand practice (Tie Sha Zhang) are forbidden in Che style Xingyiquan. Still methods like sitting meditation (Jing Zuo), standing practice (Zhan Zhuang) should be practiced but not for extended periods of time. For example Santi standing should be done for 5 to 10 minutes, while Qigong practice (sitting/lying) up to 40 minutes a time. This differs Che style from Hebei Xingyi branches, which stress importance of Santi standing over long periods of time. One of the meanings of combination between Qi and Li is coordination between breath and power, which is related to certain body structure. Only then Internal (breath) and external (movements) can be in harmony (connected). Che style Xingyiquan stresses "Internal and External are unblocked and balanced by breathing exercises"; one should neither practice to exhaustion (because it will only lead to bad quality of movements and wrong habits as a result) nor practice when tired. It is better to practice more often for shorter periods of time. Although very hard training can improve one's skill, but it is very easy to overstrain and hurt oneself. Best skill is good for nothing if you are not healthy. As already many times stressed, martial art should first of all be the art of self defence and fighting ability is the key skill. In Che style Xingyiquan routines can be divided into three categories: traditional ones, for self-defense and for actual fighting (most advanced). In the last category many kicks are added to hand movements, so often one would use both hands and a kick at the same time - this is called "striking enemy with three pieces" (San Jian Da Ren). This is also one of Che style features. While using weapons, one should with first step neutralize or break opponent's attack, and strike with the second step - this is called "reaching position with two steps". The weapons routines that express this feature are "Liu Qiang Dianzi" (spear) and "Bagua Dao" (broadsword). The power should be rooted in steps and directed by the waist; eight directions - front and rear ( e.g. front and rear hand or foot), left and right (e.g. left and right arm or leg), up and down (up are shoulders, elbows, hands; down are hips, knees, feet), opponent and I (two adversaries) - should be combined, in harmony (in case of "opponent and I" - one's movements should be chosen according to opponent's movements, not preconceived). Rhythm of movements should be clear, fast and slow separated. Both practice and fighting should have distinct rhythm: in practice Che style demands "practicing movement after movement", correctly; fighting also requires certain composition, one should not move in a disorderly fashion. In practice one should use low and large body postures to build up strength. Keeping the Middle (Shou Zhong) has two meanings: first is that in all movements one should hollow the chest and straighten the back, hands should be kept close to heart (chest) and elbows close to ribs; here "keeping the middle " actually means "guarding the center"; the second meaning is applied to fighting - one should stand in the middle and the opponent should move around him - in Taigu this is called "standing in the middle of the millstone". Keeping the Middle does not mean focusing on dantian. Body is single weighted when most of the body weight rests on one leg only - the weight distribution can be 4:6, 3:7, 2:8, 1:9, but when body weight is equally distributed on both legs, then it is considered double weighted; similar situation is with hands, which are also divided into "solid" one and "empty" one - are single weighted. Top is a popular toy, that can be rotated either by twisting it with fingers or using a whip. Top, in Taigu called "Nian Ba'er" was often used by Che Yizhai to explain Xingyiquan principles. Power should be soft and elastic, strength explosive, line of softness and point of hardness, circle connected with straight line; know obvious and hidden, be able to change and link, do not be in a rush or panic when you break opponent's defense or defend yourself and attack. The power developed during practice and used in fighting should be soft and relaxed, elastic, neither stiff nor completely loose. Only then in fighting one can strike with explosive strength. Soft power moves in lines, both straight and round, like a circle and its chord - this is called "circle connected with straight line". Hard power is used in explosive manner for a very short time, that's why it is called "point of hardness". "Line of softness and point of hardness, needle hidden in cotton, circles and straight lines mutually transforming, like wind or water" - these metaphors describe well Che style Xingyiquan. Obvious (Ming) and hidden (An) mean obvious and hidden applications of certain techniques. Typical example of hidden technique is strike to a temple in Pao Quan (Cannon Fist). One of most important skills in fighting is ability to change according to opponent's reaction, only then one will be able to control situation and not be in a rush or panic dealing with the opponent. During fighting one must first of all protect oneself, then using agile footwork take a favourable position, usually on opponent's side. Striking with fist, elbow, other part of the body (here called "soldier") will be faster if one stands near the opponent in a position in which one's "soldier" has shorter distance to reach target than opponent's "soldier". One should always avoid the main power of the opponent's attack, the "edge of weapon". "Use straight to attack slant" means one's frontal attack at the opponent' side; "use entire to strike dispersed" means using one's whole body power against part of opponent's body. "Strong beats weak" means striking hard against opponent's weak and vital part, e.g. using fist against opponent's pit of stomach or kicking his groin. While fighting one should make some fake movements to cause certain reaction of the opponent; for example, a strike to the head will force the opponent to protect his head; on the other hand, if one's hands are kept down, then the opponent will probably try to attack one's head, e.g. not protected part of the body. This is the meaning of "when you attack he will protect himself; when you give he will take". One can plot a plan to defeat the opponent using these principles that should be followed by strikes in a linked way. One's attacks should always be responses to opponent's movements. However, opponent's movements shall be reactions to one's movements, that's why initiative is so important and crucial. "Besiege Wei to rescue Zhao" is an idiom based on facts from Chinese history. "Chronicles of the Historians - Biographies of Sunzi and Wu Qi" (Shi Ji - Sunzi Wu Qi Liezhuan) note that during the period of Warring States (475-221 B.C.) 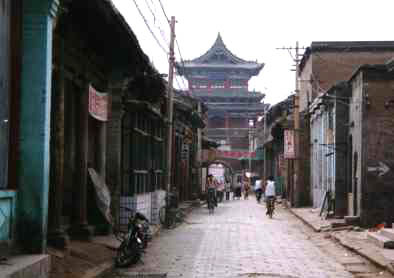 Wei soldiers besieged Handan, the capital of Zhao State. Zhao unable to protect itself asked Qi State for help. Qi generals, Tian Ji and Sun Bin, knowing that Wei main forces are outside the country and Wei State is not protected, attacked and destroyed Wei's capital, Daliang. Wei army immediately went back after having learnt about it. However, they were stopped at Guiling and defeated by Qi forces. Today this idiom indicates military strategy based on raiding enemy's back in order to force the enemy to withdraw its main attack. This emphasizes the importance of initiative in fighting. In real combat the strikes should be issued within very short time and on a very short distance. However, fastest and shortest strike will not be effective unless it accurately reaches its target. Once it fails, then it should be followed by another movement in a linked, smooth way. One should also be mentally prepared for fighting, not be afraid of defeat but rather have the spirit of a winner. Martial Arts competitions are divided into two categories: routine and free fighting. In both of them Virtue (De), in martial arts called Warrior's Virtue (Wu De), is very important. The Virtue of judges is expressed in a fair and unbiased way they give points; competitors show their Virtue by following the rules. Competition is not the place for death and life fight but rather for making friends in martial arts community. When two highly skilled martial artists meet, their strikes are not destroying but rather pointing at a certain part of opponent's body and this is enough for the opponent to recognize own defeat. When Che Yizhai and Guo Yunshen met, Che did not hit Guo, Guo did not hit Che either, but the result of the fight was recognized by both of them. This is the last part of the "Ode". Martial skill has no value without Warrior's Virtue (Wu De), that's why Virtue should precede the skill. The truth about martial arts should not be sought in novels and anecdotes, but in facts. Only through scientific research, without superstition, by making friends and exchanging knowledge of Martial Arts with generosity, Chinese Martial Arts will flourish and develop further.